General RAASM catalogue divided into three macro-chapters: lubrication-automotive, hose reels and industrial pumps. The general catalog of RAASM hose reel and cable reel is available in Italian, English, German, French and Spanish and will be your best ally in choosing these articles. 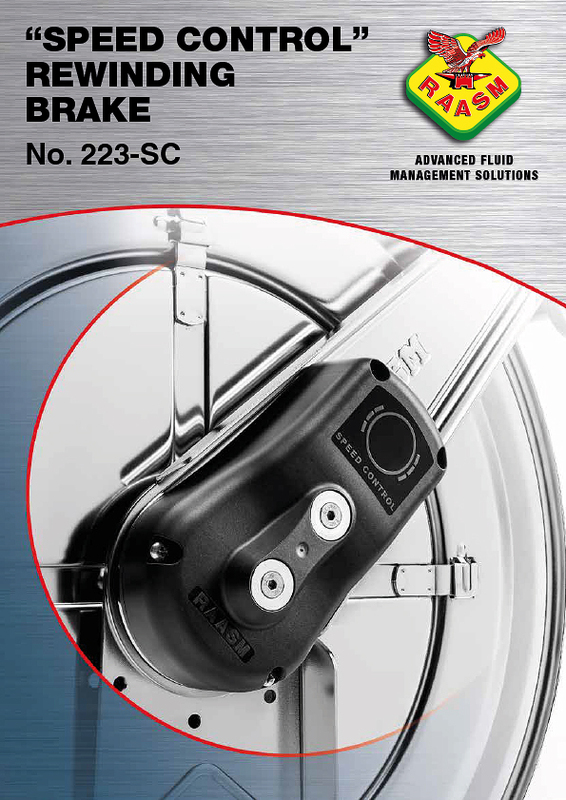 New RAASM Rewinding Brake dedicated brochure to control the hose rewinding speed in the series 430, 530, 540 and 560. 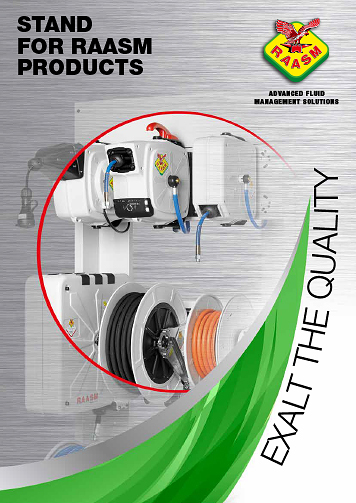 Brochure dedicated to the new automatic hose guide to properly wind up the hoses on the hose reels series 430, 530, 540 and 560. RAASM warning tape reels are the ideal solution for all those situations where it’s necessary or mandatory to delimit the dangerous working areas both for the operators and the external people. 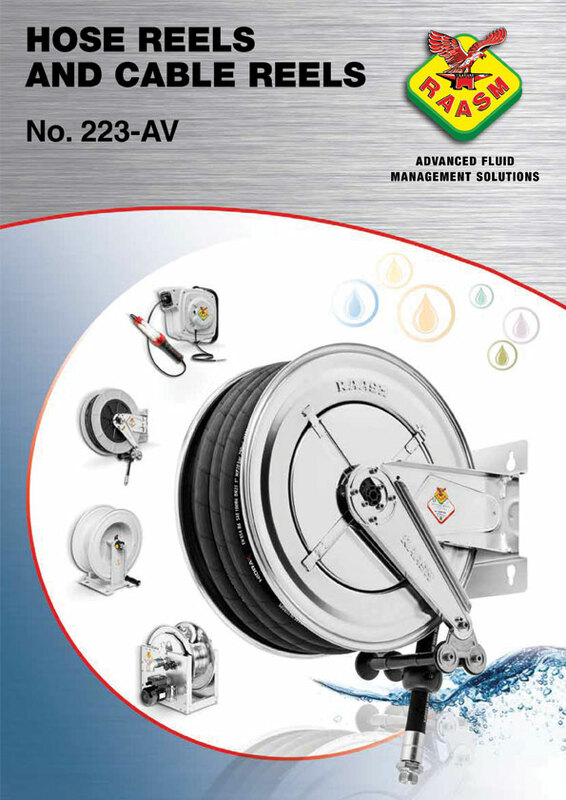 General catalogue for electric cable reels, lights and air-water hose reels in s. 280-290. 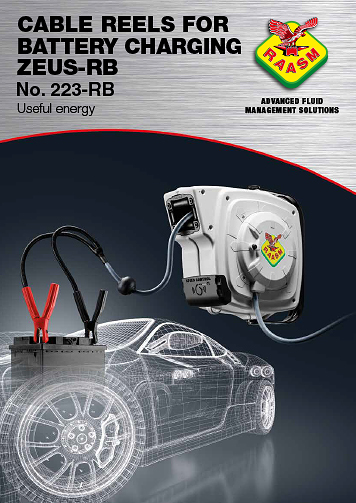 The cable reels for battery charging are the ideal solutions designed by RAASM to facilitate the battery charging of the vehicles in the whole garage, in the farthest places from the main recharging device too. Usable as an extension cable with 6 or 9 meters, the cable reel can be used with a maximum charging current of 30 A and it's equipped with a reset button and a thermic protection against the current overload. General catalogue for diaphragm pumps in full aluminium, aluminium and polypropylene, and full polypropylene. Catalogue for trolley-mounted hose reels in painted and stainless steel. 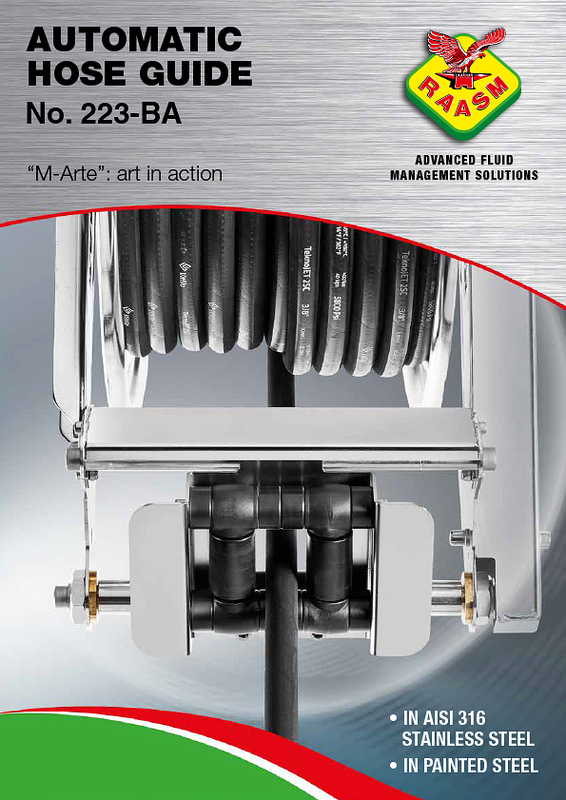 General catalogue for manual hose reels in painted and stainless steel. Catalogue presenting the FCS – Fluid Control System (Full Optional and Basic versions). Catalogue for front and bilateral service columns and those with a collection pan. 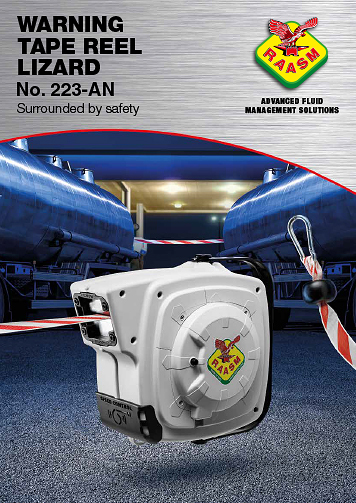 Catalogue for s. 700 manual and motorised industrial hose reels. Catalogue for s. 250-300 enclosed hose reels in painted and stainless steel. Catalogue for hose reels in painted and stainless steel for use with AdBlue®. Catalogue for fixed and portable ram hoists with ready-prepared kits. General catalogue for the digital meters and pulser family. 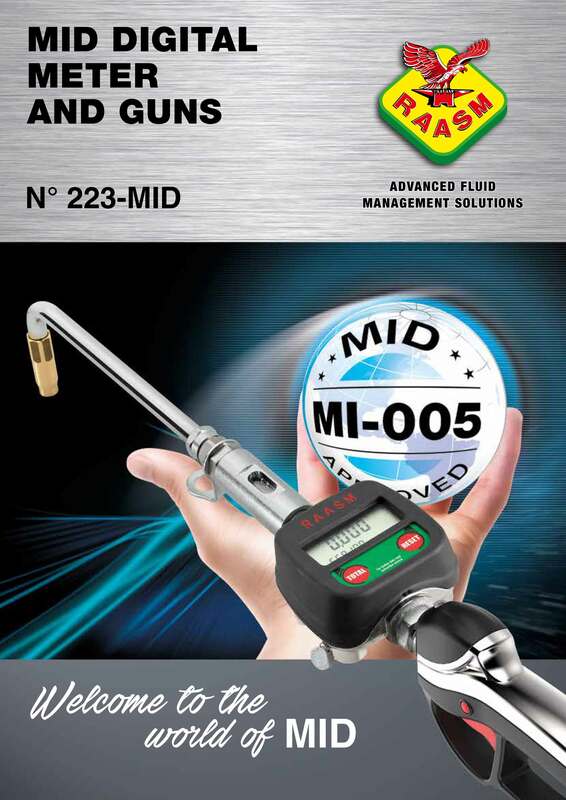 General catalogue for the digital meter and guns family with MID certification. Catalogue for manual and spring hose reels in AISI 316 stainless steel. Brochures presenting products for the cleaning sector in the automotive and industrial sectors. General catalogue presenting all available centralised lubrication systems (15, 20, 25, 30 systems). Catalogue for system 30 centralised lubrication systems. Catalogue for system 25 centralised lubrication systems. Catalogue for system 20 centralised lubrication systems. Catalogue for system 15 centralised lubrication systems. Brochures presenting products for the industrial dyeing sector and the treatment of paints, glues and silicones. Brochures presenting products for the wine and agriculture sectors. Exhibitors’ brochure presenting RAASM products to be used in stores or during promotional events. General overview of the whole range of company products.